How do I give Guest Status to the contacts on my child’s FiLIP? 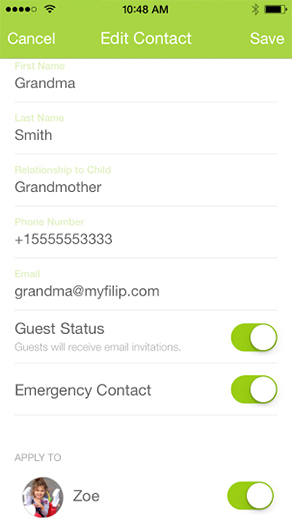 You can give Guest Status to any of the contacts on your child’s FiLIP, or none at all – your choice. There are several steps that must be followed in order to properly grant a contact Guest Status. STEP 1: Decide which contacts you would like to give Guest Status to and ask those individuals to download the FiLIP app to their mobile device (iOS or Android) and create an account. Once they get to the page in the app registration process that asks them to link their FiLIP, they can select “I don’t have a FiLIP yet” and log-out of the FiLIP app. STEP 2: From the “Contacts” page, select the contact that you would like to grant Guest Status to. Make sure they have downloaded the FiLIP app and set up their account. Then, confirm that the email address you have listed for them in your app is the same as the email address they used to set up their FiLIP app. Finally, slide the “Guest Status” button on (to the right until you see green) and then press the “Save” button at the top of the screen. If your contact tries to accept your Guest Status invitation before they have downloaded the FiLIP app, or after the 12 hour period, you may need to delete their contact information from your FiLIP app, add it again, and then go through STEP 2. How many contacts can I add for my child’s FiLIP? How do I add the contacts to my child’s FiLIP?